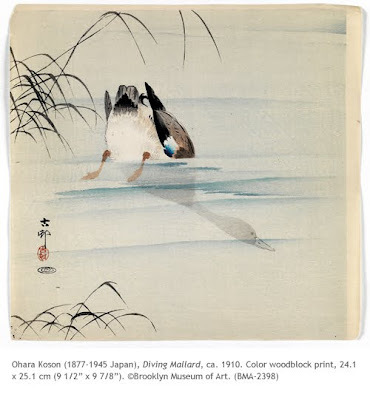 Kacho-e – birds and flowers (images) – was a traditional subject in Chinese and Japanese art, although Ukiyo-e artists, through the woodblock print medium, brought it to its greatest fruition. The artists Hokusai (1760-1849) and Hiroshige (1797-1858) were probably singularly responsible for making the subject so popular in the woodcut medium. But, by the late nineteenth century in Japan, Ukiyo-e prints were becoming eclipsed by western-introduced lithography as a medium of mass-produced imagery. However, the genre persevered well into the 20th century because of artists like Ohara Koson. Although these artists preferred the traditional technique of handing over a drawing to a woodblock carver and then a printer, there is a VAST difference in sophistication in the late shin hanga prints. They possess a sensitivity of subject and execution that we see nowhere else, not to mention that the feeling for the subject matter itself that transcends the mere “homage to nature” we see in early Ukiyo-e prints. Koson is considered one of the early 20th century masters of the shin hanga style of kacho-e. Born in Kanazawa as Ohara Matao, Koson’s traditional training included the Japanese custom of a pupil taking a mentor’s name (Susuki Koson/Kason). His main interest was in bird and flower prints, which he had executed in Tokyo by the Kokkeido publishing house, and then later the Daikokuya Company. The majority of Koson’s prints went to the US and Western Europe. Ironically, later in life, Koson chose to emphasize painting as his primary medium. There was a revival in interest in kacho-e and, in particular, Koson prints after the 1960s. When Japanese scholars wanted to study his prints, most of them had to be imported from the US.